Reams of newsprint and thousands of web pages have recently devoted themselves to scrutinizing the importance, execution and the long-term impact of the latest large-scale intervention introduced by the NDA government through the sudden demonetization of Rs 500 and Rs 1000 currency notes. However, amidst all the hype and hoopla that demonetization has brought with it, a more pertinent concern has managed to skip the limelight over the past year. This is an issue which could impact the Indian economy far more significantly than even this groundbreaking change in monetary policy, something that will be responsible not just for the stable economic growth of this country but also the welfare of our future generations. That issue is of job creation, or more specifically, India’s urgent need to tackle jobless growth and create large-scale employment opportunities. In the current scenario, the problem of unemployment exists as an entirely different demon, completely unrelated to India’s fairytale growth story. More than a million Indians become eligible to join the workforce every month. Unexpectedly, for an economy considered to be one of the fastest growing ones on the world stage, most seekers have to be turned away. So, though the country’s GDP growth continues to be healthy, the bad news on the jobs’ front warrants the Union government’s immediate attention as jobless growth does not help anyone. According to the Labour Bureau, India’s main agency for collecting statistics related to the creation of jobs in labour-intensive sectors, no new jobs were created, but there was actually a fall of 20,000 jobs across eight labour intensive sectors in the December quarter of 2015. It would be naïve to argue that the government should be able to employ all the new or displaced job seekers, despite the existing paucity of qualified people to take up so many vacant posts in the public sector. While Prime Minister Narendra Modi’s efforts to make the bureaucracy a lean, mean and efficient administrative machine are laudable, what it also means is that the public sector will have to inevitably shrink. Compared to 1996-97, when more than 19 million people were employed in government jobs, 2016 saw the occupation of such positions reduce to 17 million, despite the massive rise in population. If the public sector is unable to hire, then jobseekers will automatically turn to the private sector. This is where India’s broader employability problem comes into the picture. However, this has to be seen in the light of one contradictory report that says that occupation under the government’s flagship rural employment program, MGNREGA, saw more than 200% hike in November and December 2016. While MGNREGA workers were not more than 35 lakh in months preceding demonetization, the post-demonetization period saw this figure touching 80 lakh. This trend is worrying as it could mean that the number of jobs contracted in MSME sector after trade and commerce got hit due to the cash crunch in the months following demonetization. Is there a way out? Even when we remove demonetization from the backdrop, job growth figures have always been a painful area for the present government. Add to it the growing number of job-seekers and the looming threat of automation and 3D printing that will replace humans like never before. Here it needs to be emphasized that agriculture, manufacturing, and services by themselves cannot fully meet the employment needs of the Indian workforce. There has to be a way out to prevent the migration of labourers from asset-building jobs to MGNREGA jobs that are nothing but a sops scheme. Let us now see how this can be achieved. To generate more asset-building jobs across the country, Indian industry should be able to look towards cost-effective inputs with abundant and cheap raw materials to get its mojo back. In the current scenario, the labour-intensive construction industry and the infrastructure sector have tremendous potential to generate a substantial number of jobs. Since the Union Budget 2017-18 will be presented within the next few weeks, the Union government can ensure a boom in this sector by addressing some long-pending issues faced by the stakeholders. 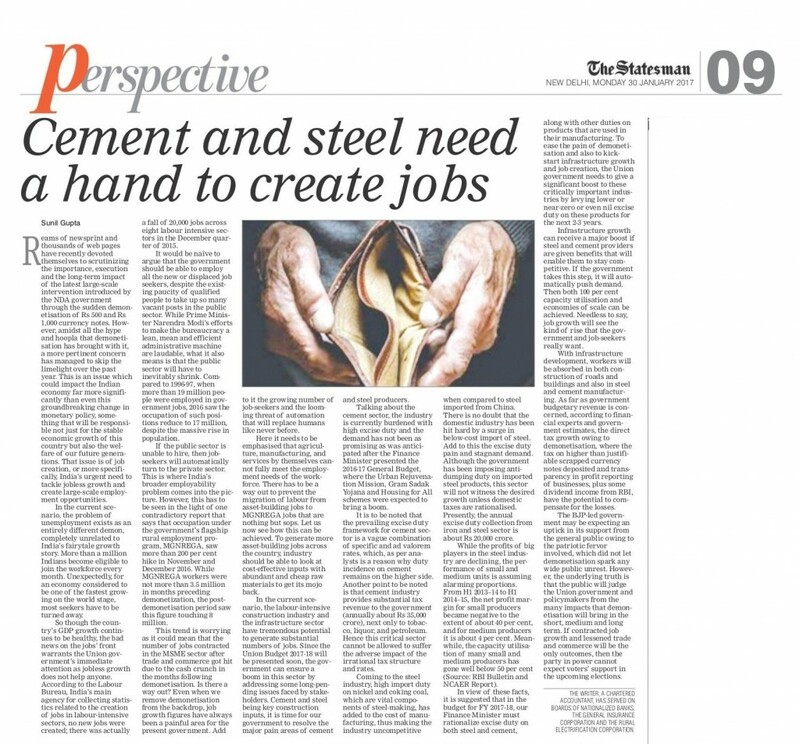 Cement and steel being key construction inputs, it is time for our government to resolve the major pain areas of the cement and steel producers of our country. Talking about the cement sector, the industry is currently burdened with high excise duty and the demand has not been as promising as was anticipated after the Finance Minister presented the 2016-17 General Budget, where the Urban Rejuvenation Mission, Gram Sadak Yojana and Housing for All schemes were expected to bring a boom for the cement industry. It is to be noted that the prevailing excise duty framework for cement sector is a vague combination of specific and ad valorem rates, which, as per analysts is a reason why duty incident on cement remains on the higher side. Another point to be noted is that cement industry provides substantial tax revenue to the government (annual tax revenue from the cement sector is about Rs 35,000 crore), next only to tobacco, liquor, and petroleum. Hence this critical sector cannot be allowed to suffer the adverse impact of the irrational tax structure and rates. Coming to the steel industry, high import duty on nickel and coking coal, which are vital components of steel-making, has added to the cost of manufacturing, thus making the industry uncompetitive when compared to steel imported from China. There is no doubt that the domestic industry has been hit hard by a surge in below-cost import of steel. Add to it the excise duty pain and stagnant demand. Although the government has been imposing anti-dumping duty on imported steel products, this sector will not witness the desired growth unless domestic taxes are rationalized. Presently, the annual excise duty collection from iron and steel sector is about Rs 20,000 crore. While the profit margins of the big players in the steel industry are declining, the performance of the small and medium units in the sector is assuming alarming proportions. From H1 2013–14 to H1 2014–15, the net profit margin for small producers has become negative to the extent of about 40%, and for medium producers it is about 4%. Meanwhile, the capacity utilization of many small and medium producers has gone well below 50% (Source: RBI Bulletin and NCAER Report). In view of the above, it is suggested that in the upcoming budget for FY 2017-18, our Finance Minister must rationalize excise duty on both steel and cement, along with other duties on products that are used in their manufacturing. To ease the pain of demonetization and also to kick start infrastructure growth and job creation, the Union government needs to give a significant boost to the critically important steel and cement industry by levying lower or near-zero or even nil excise duty on these products for the next 2-3 years. Infrastructure growth can receive a major boost if steel and cement providers are given benefits that will enable them to stay competitive in the race. If the government takes this step, it will automatically push demand for steel and cement. Then both 100% capacity utilization and economies of scale can be achieved. Needless to say, job growth will see the kind of rise that the government and job-seekers really want. With infrastructure development, workers will be absorbed in both constructions of roads and buildings and also in steel and cement manufacturing. As far as government budgetary revenue is concerned, according to financial experts and government estimates, direct tax growth owing to demonetization, where the tax on higher than justifiable scrapped currency notes deposited and transparency in profit reporting of businesses, plus some dividend income from RBI, have the potential to compensate for the losses. The BJP-led NDA government may be expecting an uptick in its support from the general public owing to the patriotic fervor involved, which did not let demonetization spark any wide public unrest. However, the underlying truth is that the public will judge the Union government and policymakers from the many impacts that demonetization will bring in the short, medium and long term. If contracted job growth and lessened trade and commerce will be the only outcomes, then the BJP-led Central government cannot expect voters’ support in the upcoming elections. Thus, by rationalizing and easing taxes on crucial sectors of steel and cement in the upcoming Budget, the Union government will not only give a major impetus to these labour-intensive and high employment generating sectors, but the infrastructure sector will also witness unprecedented growth in the coming years. This will indirectly result in domestic as well as international image improvement of India, while also ensuring widespread and substantial absorption of the workforce across the country. Here, it needs to be emphasized that India currently has an enormous appetite for infrastructure development, not to mention the critical need for this infrastructure creation. In the present scenario, rationalization of the duty structure of cement and steel industry can give a significant boost to infrastructure development. Job creation and rise in consumption and spending, coupled with an overall upsurge in macro and micro economic indicators, will be other added advantages. Since past many years, production of raw steel and its consumption has increased in India. However not all steel produced is used, yet we import, this is where the problem lies. Minimum Import price may appear as a tool to safeguard domestic industry but it is a tool that kills incentives for innovation. No steel manufacturer hence tries to lower cost of production. Both these sectors are part of the index of industrial production as they are the key players in country’s infrastructural and overall development. They need renewed focus from the policy makers. China has disturbed steel industry of the world by over capacity and dumping its exports at cheap rates. All WTO members must protest this and ban this below-cost exports by China. Government has helped steel sector by placing anti dumping and other duties on steel imports however imports are still high due to their cost effectiveness. Similar to how the government hand held textile industry of India, cement manufacturers too need some sops. Regulations have to be cut down and excise duty waived off completely. After demonetisation, the real estate sector has been hit very hard. Hence their will be a depression in steel and cement sector. If government can lower interest rates, it will help. Import of raw material adds to the cost of steel manufacturing. Import duties on such materials be lowered down to let domestic players become competitive. Unless labour laws are all consolidated and structured, job growth is very hard. Trade unions must come close to the government on amendment of labour laws rather than delaying the matter. Hard to believe that unemployment rate is one of the highest presently at above 5 percent. Modi and his team have to look for ways to augment industries that are labour intensive.